I used to be terrified to speak in public. In fact, I was scared to raise my hand in class, even to speak French in my French classes. I took a D in one of my required university journalism classes because 80% of the grade came from giving a presentation. When forced to speak in class, my heart would pound so hard I was sure I’d have a stroke. I never knew how loud my voice was, since I could barely hear it over the hammering in my chest. As I began to get published, I’d agree to read at release events but would back out at the last minute. It was awful. I let people down because I was so frightened. Eventually, I forced myself to read in public. It helped once I saw a videotape of myself talking to a crowd. No one could see how terrified I was. It helped even more when I watched a local slam poet read — and the manuscript shook so much in her hand, I wondered how she could see the words. If she was that nervous, then it was okay for me to be, too. I’ve been speaking in public now for 18 years. I’ve read in bars, bookstores, cafes, kindergarten classes, and on the radio. I’ve spoken at book festivals, writers’ conferences, and cemeteries. I’ve hosted open mics and readings, told stories and given awards. I’ve performed while coming down with the flu and colds, recovering from laryngitis, and suffering from morning sickness. What hasn’t killed me really has make me stronger. Performing in public has finally stopped scaring me to death. 7) Most importantly, promote your events so people will come. If I can get over my terror of speaking in public, so can you. Contact me for more information about setting up this seminar. I debuted this class at San Francisco’s Writing Salon in July 2012. 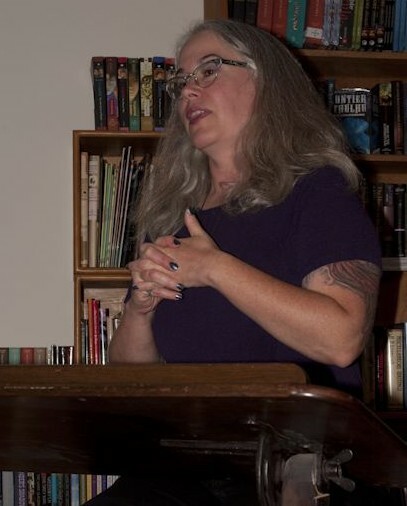 Loren Rhoads was the editor of Morbid Curiosity magazine for ten years, during which time she hosted annual release readings that drew as many as a hundred people. She’s read at bookstores from Elliott Bay Books in Seattle to Borderlands Books in San Francisco and Stories Bookstore in Los Angeles. She’s performed at the Hypnodrome in San Francisco, the West Hollywood Book Fair, a Death Salon, an Obscura Salon, and read at six World Horror Conventions. She’s performed on podcasts and radio shows on college stations, pirate radio, and even KFOG and NPR. She’s set up and hosted group readings, solo readings, release events, fundraisers, open mics, storytelling events, and addressed the Cypress Lawn Book Club.